While we walked to school the other day, Isaac told me that recess isn’t fun anymore because two of his friends won’t play with him. He said “sometimes I feel like I don’t exist at all.” It gave me such a pang! I used to feel that way all the time. I used to feel insubstantial and empty. But I was a teenager! He’s so young to feel that way. I suppose sometimes you’re so close to yourself – literally inside, looking out – that you can’t see yourself at all. I used to get all confused about that. I felt sort of dull and colorless, and it seemed as though everybody around me was brighter and louder – more visible, more easy to hear and understand. I still feel that way sometimes, when I’m with people who are charming and vocal, but I’m not so worried about it any more; I no longer struggle to make myself heard, because so often it just doesn’t matter. I used to try to make myself disappear, in some ways. I wanted to be small and weightless and invisible. I feel so much more solid, now. I feel as if gravity has much more pull on me, these days. But I’m fine with that, it’s a way to feel rooted and real. It’s a way to make shyness and self-consciousness immaterial. The funny thing is that Isaac is so vivid, so vibrant – he’s not shy at all, he’s the sort of boy you can imagine walking into a room and throwing up his arms and yelling, HERE I AM!! He’s like sunshine, but he’s got a seriousness and depth to him as well. We sometimes laugh that if he had a band it could be called “Little Mr. Sunshine and his Dark Thoughts.” I just hope he knows how brightly he glows! Of course beets grow upward but they’re rooted. They’re beautiful and bright, and covered in dirt beneath the earth. We just got a big lovely bunch from the farm, with the greens attached, and I wanted to use every part. So I made a curry with the leaves, in a sauce of cashew and pumpkin purée. And I grated and roasted the beets themselves, and mixed them with chickpea flour and spices to make kofta. 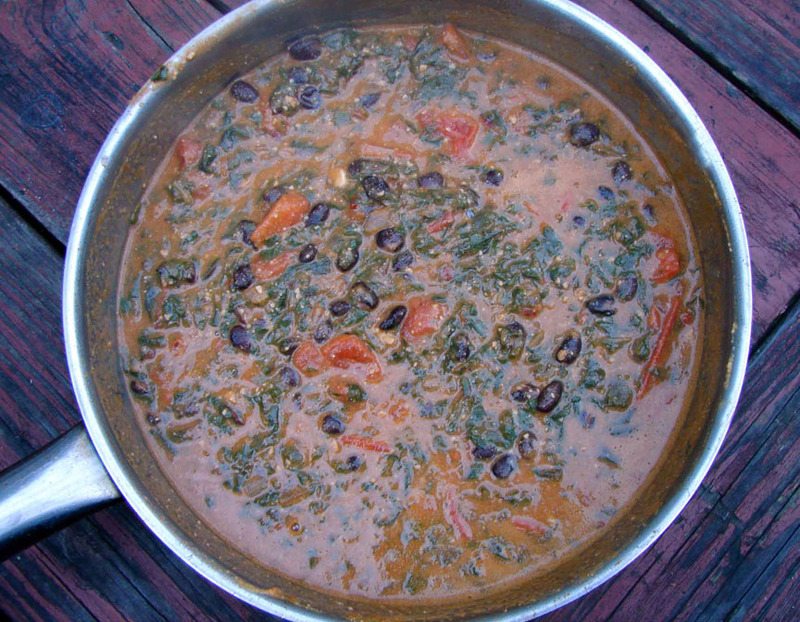 If you don’t have beet greens, this curry would work equally well with spinach, chard, kale, or any other kind of green you have! Here’s Linton Kwesi Johnson with Age of Reality, which, upon reflection, doesn’t have much to do with anything, but I like it. Set a large pot of salted water to boil. Add the beet greens and boil till quite soft – about ten minutes. Drain, cool, and chop very finely. Meanwhile, in a large frying pan over medium heat, warm the olive oil. Add the shallot and cook for about a minute. Add the garlic, cook till it just starts to brown. Add the black beans and red pepper flakes. Stir and fry for about a minute. Add the beet greens and tomatoes, stir and fry for about a minute. In a blender or food processor combine the cashews, pumpkin puree and about 1 1/2 cups water. Puree until smooth. In a large bowl, combine the chickpea flour, spices, herbs, baking soda, salt and black pepper. Stir in the water. You should have a thick batter. Stir in the roasted beets. Leave to sit for about fifteen minutes. Lightly oil a large baking sheet. Drop the batter by teaspoonfuls onto the sheet. Bake about 20 minutes, till starting to brown. Turn once or twice so that they brown nicely on both sides. 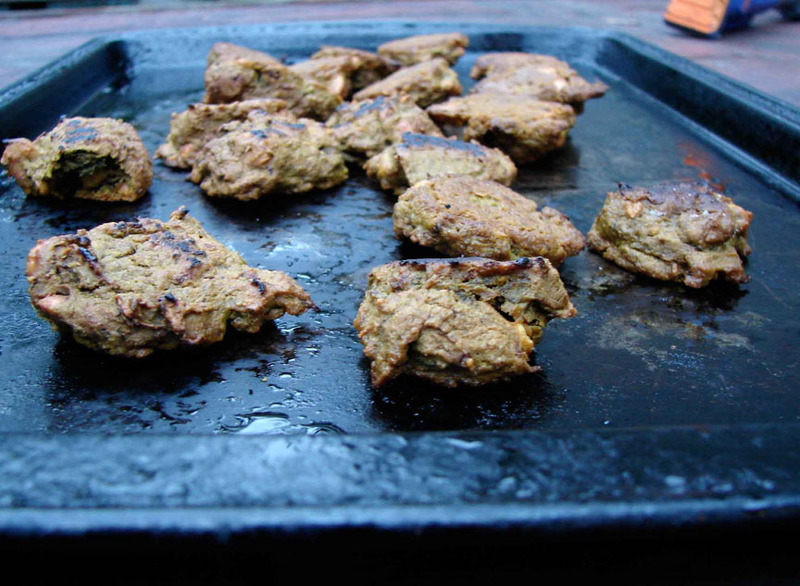 This entry was posted in beans, croquettes, recipe, sauce and tagged besan, chickpea flour, curry, gram flour by Claire. Bookmark the permalink. I love this about you and Isaac! !